The Tiffen 5 x 6" 3 Tropic Blue Hard-Edge Graduated Filter helps to specifically add a cool, greenish-blue coloration to skies and other bright areas of an image while allowing a portion of the image to remain neutrally colored. The filter's coloring is densest at the edge and tapers to clear by the middle, with a hard-edged transition between the density and clear areas. The 3 color density provides more tropic blue coloration than the 2 density filter. This filter is made using ColorCore technology, a process that involves laminating the filter substrate between 2 pieces of optical glass and grinding flat to a tolerance of 1/10,000th of an inch. It measures 5 x 6" / 127 x 152.4mm. Note: A horizontal orientation filter's line of transition runs parallel to the long side of the filter. Provides a deep greenish blue coloring to select areas of the image. 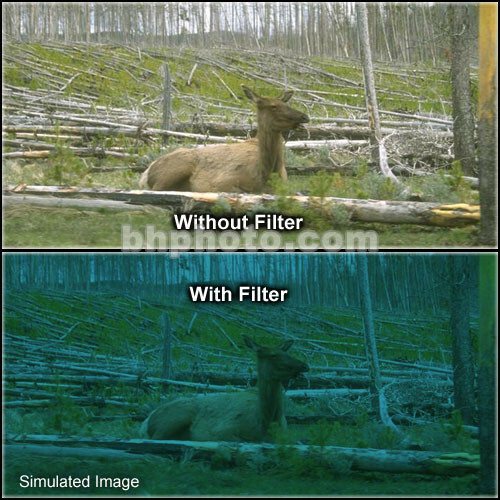 Graduated filter design keeps a portion of the image neutral, resulting in a more realistic look while allowing for the sky or other bright areas to take on the color of the density.